Third seed and seven-time champion Rafael Nadal defeated Martin Klizan 4-6, 6-3, 6-3, 6-3 on Friday at Roland Garros to set up a third round clash against No. 27 seed Fabio Fognini. 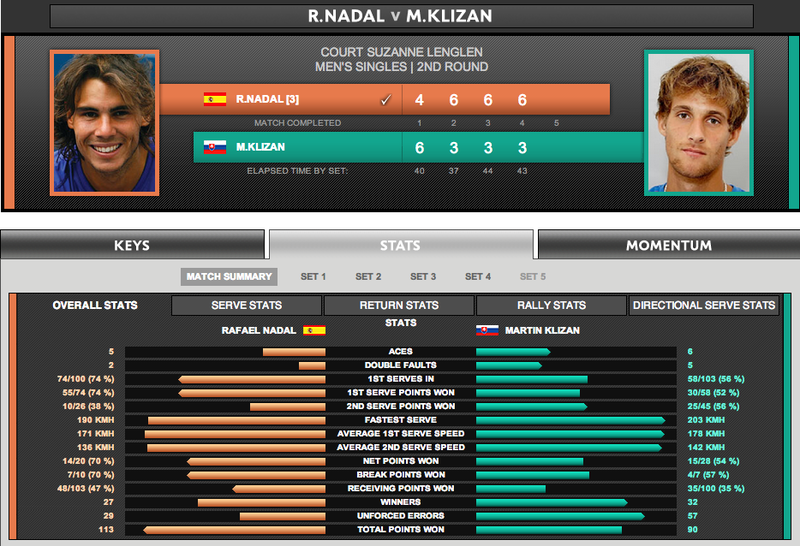 Klizan took advantage of Nadal’s poor stroke-play to win the opening set. At 3-3, Nadal dropped to 15/40 subsequently hitting a forehand wide down the line. It appeared to be that Nadal’s string tension was too tight for the overcast and cold conditions in Paris. Klizan confirmed the break with a hold to love. Nadal brushed off the early setback by tightening up his game on serve, stepping closer to the baseline and dictating rallies from his forehand wing. He moved into a 4-0 lead, only to be broken to 30 by Klizan, who had been treading carefully on his right ankle mid-set. Nadal started to win the shorter rallies to take the 37-minute set. Klizan's error count increased in the third set as he counter-attacked. But Nadal, just four days shy of his 27th birthday, capitalised on half chances to increase pressure on the World No. 35. Crucially, Nadal won 36 per cent of his returns off a first serve to seize control of their first FedEx ATP Head2Head meeting. Nadal was not at the peak of his powers, but found a way to win running through the fourth set. Hitting his forehand short in the early stages, the Spaniard tightened his defensive game to record his 38th victory in 40 matches this season. Nadal has won six titles from eight finals since February.